Reception, lobby bar, TV hall, conference rooms, restaurant with non-smoking section and terrace, bars, disco, outdoor swimming pool with children's section, indoor swimming pool with children's section, water slide. 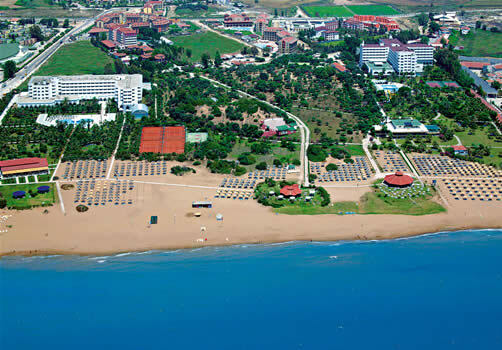 Billiards, table tenis, tenis courts, Turkish bath, sauna, fitness, miniclub (4-14 age). Tennis rackets, lightning of the tenis courts, massage, water sports. Bathroom with hairdryer, minibar filled daily with water, sat TV, air-conditioning, telephone, safety box, balcony, sofa. Situtated directly on the beautiful, wide sandy beach. Sunbeds, umbellas and beach towels available free of charge. Unlimited soft and alcoholic local drinks from 10.00 till 00.30. 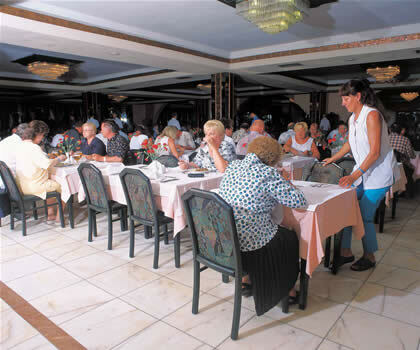 Open buffet breakfast, lunch and diner, snacks. Coffee&cake, ice cream between 15.00-17.00.